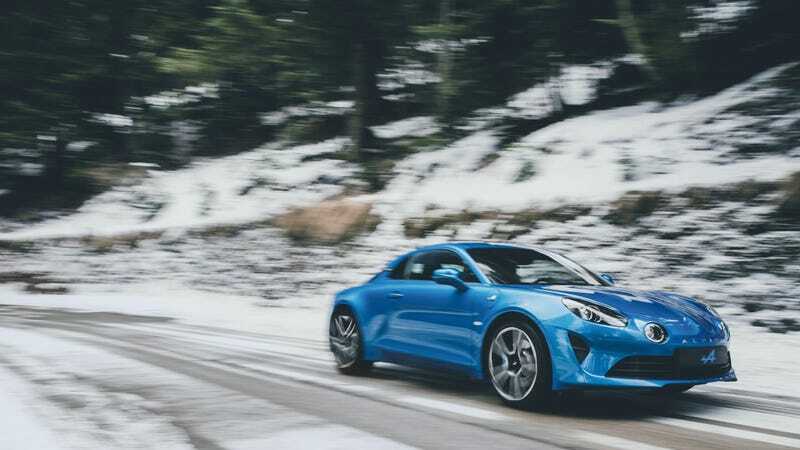 Production on a new line for the Alpine A110 has finally begun, its owner Renault said Thursday. The reborn brand hopes to make around 6,000 cars yearly, though only 1,955 for an initial limited-edition run to commemorate 1955, the year Alpine was founded. This is all good news, since some cars, like the old and new Alpines, just make you happy. Renault spent $42 million upgrading a plant in Dieppe, France to build the first new Alpines in 22 years. The new Alpine, like its forebears, should have plenty of zip, making 252 horsepower out of its 1.8-liter turbo four cylinder engine, which may not sound like much until you consider that the car only weighs around 2,381 pounds. The first deliveries of the Alpine are expected to start early next year. It’s priced at 58,000 Euros, which is about $68,000 at current exchange rates. But it’s not coming to America, of course, since we don’t deserve nice things. Still, a big deal in our books. But will people buy it in the markets it’s sold in? Right now is a pretty rough time for sports cars and small cars; luckily, Alpine seems to want to take advantage of this buy building a crossover as well, AutoExpress reports. We’ll see how that goes, but I can tell you it won’t be as fun or look as good as the A110 does.